I have a bit of a hate-hate relationship with my hair. I’ve not been blessed with the thickest, straightest, most voluminous, sleek or pigmented ‘do; in fact my thin but coarse and ever-more-grey hair is something that generally speaking I struggle with more than any other area of my body. Even though my skin defies my age, my hair gives the game away and needs regular dying and styling to keep it looking even half decent. I’ve spent most of my life buying, trying and testing anything that would help create the look I was after – even finding myself working in shampoo development as a graduate, so was my obsession with all things hair! Suffice to say it’s an area I’ve got a very intense relationship with, so it wasn’t a surprise to me that when I started trying on wedding dresses at the beginning of 2017 my hair was an area that concerned me. Looking in the mirror at myself in a very white dress, my very dark hair wasn’t something I was really on-board with. I looked a bit like Snow White, and not in a good way; I needed to desperately lighten my locks to warm up my complexion and prevent such a strong contrast in colour, as well as looking after it to ensure it was healthy looking and full of shine. After a consultation at my regular hairdresser, we decided upon a full colour cleanse to remove the harsh dark tones and then re-apply a warmer shade of brown over the surface which could be maintained in the lead up to my wedding day. Although I’d had one of these many moons ago, I wasn’t prepared for the sheer mess my hair became in the coming weeks and months. My hair was thinner, coarser and more flat than it had ever been; the colour faded incredibly fast and the ends looked like they constantly needed a blooming good trim. I was not in a happy place – and neither was my hair. According to Nanogen, hair experts in thickening and growth products, 72% of us stress about our hair and how it looks; this is only exacerbated in the run up to a big event like a wedding, prom or milestone birthday. I would’ve probably been worrying about my ‘do anyway, but considering what I’d just done my hair stress levels were at an all time high… While I was having a mild freak out about the state of my head, the guys over at Nanogen stepped in and offered to help boost my confidence with a trio of products that claimed to offer guaranteed results. Their salon-style treatments provide hair with added shine, an instant thickening and volumising effect, plus they help to stimulate hair growth over time too. The three step system was just what the hair doctor ordered! Featuring a complex of actives including their unique Hair Growth Factors, which support and stimulate the natural processes found in hair to maintain healthy hair growth, this shampoo is rich and lathers beautifully to help leave hair feeling squeaky clean – without stripping it of moisture. Redensifying Peptides aid the prevention of follicle shrinkage and loss of hair anchoring, while salicylic acid provides deep cleansing to remove any dead skin or dirt that may be blocking hair follicles. Additionally, soothing aloe and chamomile helps to reduce irritation and provide ultimate scalp comfort for long-term health. shampoo and conditioner routine – think of it like a face mask for the scalp, rather than a pampering treatment. The Nanogen conditioner contains the same complex of actives as the shampoo to support and stimulate hair growth, alongside hyaluronic acid (an ingredient usually found in skincare) to provide intense moisturisation for the hair and scalp. Retaining up to 1000 x its weight in water, it gives added support to hair follicles which in turn helps hair to look and feel younger. This super nourishing formula also contains Provitamin B5 and Caffeine to stimulate the hair follicle, leaving both hair and scalp feeling calm and nourished. What I’ve really been loving about this system over the last month or so, is the fact it doesn’t feel like a ‘system’. It doesn’t require anything more than I’m already doing, but helps to boost the condition and health of my hair – both from within and on the surface. From the very first application I felt a difference in the smoothness of my hair, and the fact it had a touch more bounce than usual, and when I ran out for a few days and switched to another brand my hair definitely felt worse off for it. The shampoo is delightfully light and effective without stripping strands, the conditioner lightly nourishes and can be applied direct to the scalp without weighing hair down (it’s quite strange to intentionally apply conditioner to the scalp after so many years of avoiding it!) and the mask is creamy and hard-working. If you’re wondering what’s different about Nanogen, then it’s all about the scalp. Healthy hair starts from within, but the majority of products only target the hair that’s sprouted from the top of your head – which is already dead and much harder to do anything with. 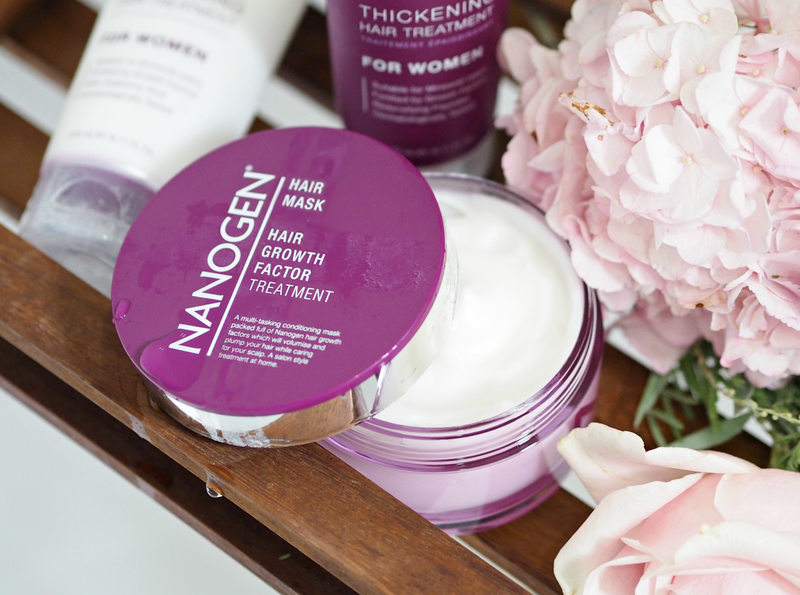 Nanogen targets the hair follicles, helping to ensure they’re as healthy as possible and can therefore produce hair that’s as healthy as possible; their formulas stimulate hair growth and ‘re-awaken’ dormant follicles to help maximise the potential volume and health of your overall ‘do. Every one of their products contains a unique -combination of ‘Hair Growth Factors’ that include Larix Europaeabark Extract to prolong the growth phase of the hair’s cycle (supporting the follicle’s ability to feed the hair which in turn means growth is sustained for longer,) Pea Sprout Extract to stimulate the production of hair cells for thicker and more dense hair, and Peptides to facilitate hair anchoring to reduce shedding for better overall thickness. ecouraging nourished and shiny hair. Finally, caffeine effectively penetrates the hair root and stimulates hair follicles for faster, stronger hair growth; it’s like a cup of coffee for your ‘do, kick starting it when it’s feeling a little lacklustre. Although it’s hard to know what’s going on beneath the surface, this is serious science and the products are clinically proven to really provide results. That’s enough for me to keep it up. 1. Switched up my regular shampoo and conditioner for Nanogen Thickening Hair Treatments; no extra effort, but all the extra care I needed. 2. Treated my hair to an intense mask at least once a week: my fave combo was Nanogen Hair Growth Factor Treatment Mask on the scalp and Philip Kingsley Elasticizer on the ends! 3. Visited my hairdresser religiously every six weeks for a trim and a treatment. It’s amazing the difference chopping off straggly ends and a quick professional treatment can make. 4. Invested in an in-salon colour, locking it in with great styling products that helped to maintain its vibrancy. Box dyes are no longer my friends. 5. Tried to stay away from the straighteners as much as possible, instead tying my hair up or leaving it au naturel – because ironing it every day was never going to do it much good. So here I am, ready to walk down the aisle, and my hair is SO much better than it was a few months ago. Although I’ve still got a way to go, it definitely feels thicker and more voluminous than it has in a long time – while the texture and colour are far closer to what I desired pre-colour cleanse. 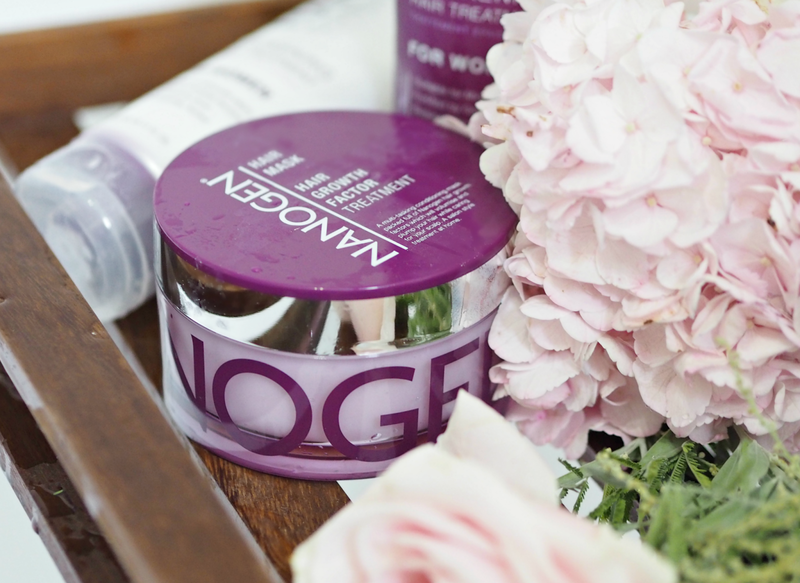 The Nanogen products really seem to have helped already and I’m definitely going to keep using them to help boost my barnet even more in the coming months. (I’m on my second round of products already!) Their unique combination of ingredients has the science geek inside me hooked, while the result on my head has left me feeling swish-ier than ever. That’s all a bride-to-be can ask for. Got a big event coming up, or just concerned about the health and vitality of your hair? Want to turn your ‘do around and ensure it’s the healthiest and thickest it can be? I’ve teamed up with Nanogen to give TEN of you the chance to try the full system and see if it can make a difference to you too. Just enter via the widget below! This is a sponsored post in partnership with Nanogen; all opinions and experiences are my own. Previous Post What Does The Demise Of Glamour Magazine Mean For Both Print & Digital Media? It's amazing how important your hair becomes pre wedding! I'm very jealous of your thick hair too – the dream! Great article, I'm trying to improve the look and feel of my hair before my wedding too.